This CD has been deleted, but is once again available as a digital download. Christy OLearys distinctive, lyrical and very traditional style of singing and playing has graced two of the best-known bands playing traditional Irish music today - Dé Danann, with whom he toured in the early eighties and Irish/Scottish band Boys of the Lough, of which he was a member for twelve years until 1997. DIRTY LINEN "In the world of small Celtic music labels, there's no classier outfit than Old Bridge Music, run by producer and multi-instrumentalist Chris Newman. The latest release from Old Bridge is The Northern Bridge, the first solo CD by Newman's Boys of the Lough bandmate Christy O'Leary. O'Leary is a terrific singer in English and Irish, as well as playing uilleann pipes, tin whistle, fiddle and harmonica. For fans who have wished for a more concentrated dose of his talents than are to be found on Boys of the Lough albums, The Northern Bridge, one of the most listenable albums in Irish music history, will be a welcome remedy. It is perfectly balanced, containing seven songs sung in O'Leary's trademark rich, sweet voice, along with five sets of tunes played on various instruments. The songs are all from Ireland, and include such well-known numbers as Moorlough Mary and Peigín Leitir Mór, as well as lesser-known pieces like The Groves of Donaghmore and Young Reilly the Fisherman, both lovely songs despite their obscurity. The tunes are split about evenly between Irish and Swedish music; O'Leary lives part of each year in Sweden and is married to a Swede. Both types of material are handled very nicely: a solo pipe air learned from the playing of Leo Rowsome and a slip jig by Máire Ní Chathasaigh are beautiful. Interpretations of a Swedish waltz by Ale Möller and a light, bouncy slängpolska are equally impressive. There are, in fact, many highlights: Newman's guitar solo during The Banks of Sullane, O'Leary's springy regulator work behind his and his brother's fiddling on a set of Kerry tunes, and his perfectly controlled unaccompanied vocals on Moorlough Mary are all examples. O'Leary is backed by a pile of musicians, but most importantly by Newman, whose melodic, harmonic and rhythmic accompaniments on guitars, mandolins, keyboards and basses are nothing short of brilliant. The album's arrangements are complex enough to be interesting without sounding cluttered, and the production is clean and unobtrusive. In short, this is as near to perfect as anyone could wish for." IRISH MUSIC MAGAZINE "My first CD to review in the new year and I think I've won the lotto. Christy O'Leary has a fine traditional pedigree, born in Kerry, taught the pipes by Michael O'Riabhaigh in Cork, performed with De Dannan in the early 1980s and a fully paid up member of Scottish based Boys of the Lough since 1985. This is his long overdue solo album, and it's a gem. The title refers to his wanderings around Ireland, associations with Scotland (via the Boys) and connections with Scandinavia (through his Swedish wife). Christy plays uilleann pipes, whistle, fiddle and harmonica. His piping is lyrical, naturally clear, and totally uncluttered by any electronic wizardry. The same can be said of his singing, rooted firmly in the traditional styles of Kerry and West Cork, simply wonderful diction and control without sounding staged or strained. Christy is joined by brother Tim on fiddle and husband and wife virtuosi Chris Newman (guitar and mandolin) and Máire Ní Chathasaigh (harp and piano). The arrangements are tight and lively with many interesting cross rhythms employed throughout (notably a Bill Munro sounding mandolin intro pulsating with Chilean heart beats on The Trip Over The Mountain). There are 7 songs and 5 instrumentals (two of which are Irish and three from Scandinavia, the latter performed with a strong Kerry accent). With a running time of 45 minutes this is a superb introduction to the multi-talented Mr O'Leary and with songs as good as Young Reilly The Fisherman and Jimmy Mo Mhile Stor there's clearly enough emotion in the CD to see off a man sized box of Kleenex. Certainly a name to watch for in '97." STEPPIN' OUT "Exemplary work again from Old Bridge Music's Chris Newman steering co-Boys of the Lough member Christy O'Leary through a truly rich album of traditional music from sources both Irish and Swedish. Blessed with a sweet, lilting voice that evokes his Irish roots this is an album that will gently creep up and unsuspectingly catch you out with some of the best arrangements this side of Planxty! As well as a fine 'auld chanter', Christy's own instrumental dexterity along with the aforementioned Newman (superb on mandolin and guitar as ever), Máire Ní Chathasaigh's harp and brother Tim O'Leary and Richard Curran on violins add masterful contributions. If ever there was an album worthy of entering everyone's folk collection then this is it." THE ULSTER HERALD "Also available now is the long overdue solo album from one of this country's most gifted uilleann pipers. 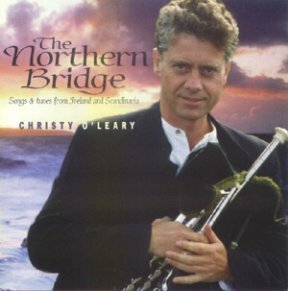 The Northern Bridge features Kenmare-born Christy O'Leary performing a range of songs and tunes from Ireland and Scandinavia put together with a most unique style of playing and accompaniment. Christy's distinctive, lyrical and very traditional style of singing and playing has graced two of the best known bands playing Irish music today - De Danaan and the Boys of the Lough, of which he has been a member since 1985. This album has been produced and arranged by his colleague in the latter band, Chris Newman, who also provides excellent accompaniment on a number of instruments ranging from guitar, mandolin and keyboard. The introduction of Scandinavian folk music makes for interesting comparisons with Sligo's Dervish who matched this cultural crossover on last year's 'End of the Day' album. In 1992, Christy married a Swedish girl and has collaborated with musicians from that country for a number of years now. Recently he has divided his time between Sweden and his home in Scotland, thus the title The Northern Bridge, an apt description of this professional and personal journey." THE IRISH TIMES "Singer and piper Christy O'Leary is much travelled both in musical and purely geographical terms. From the biographical notes this seems to have set in early in life. It is reflected very thoroughly here, on an album which ranges far and wide over regional song and tune repertoires. A coherent and organised piece of work, it is unified around particularities of vocal style which derive in accent and tone from his native Kerry, and pipering learned from Micheal O Riabhaigh, the great teacher of the Cork Pipers Club. An accomplished fiddler, he plays a set of slides with his brother Tim also on fiddle, affirming a Sliabh Luachra birthright. A raucous Peigin Leitir Mor has Kerry manners put on her, while 'Moorlough Mary' learned from Paddy Tunney is sung unaccompanied, smoothly and fluidly phrased. Pipes he uses to good effect on the three Scandinavian dance tunes, and magisterially on the air Rocking The Cradle which seamlessly flows into The Chestnut Tree, Máire Ní Chathasaigh's slip jig. The Banks of Sullane, dressed out in fine accompaniment is a masterpiece of vocal delicacy." FOLKWRITE "Oh, but this is gorgeous. Christy O'Leary is the pipe player, whistle player, harmonica player & singer, first with De Danaan in the early 80s & with the Boys of the Lough since 1985. This is his first solo album & on this evidence I am totally baffled as to why he hasn't been asked to produce a whole string of them by now. He sings with a lyrical high baritone, plays like an angel & is accompanied by 'that man again' Chris Newman, whose accompaniments & corruscating runs act as a perfect foil to the soloist. The production is of a higher class than most & is by (wouldn't you guess it!) Chris Newman. As if his guitar, mandolin, bass & keyboard performance wasn't enough, further aural delights come from Tim O'Leary (fiddle), Richard Curran (violins) & Máire Ní Chathasaigh (harp). The repertoire is a mixture (as you would expect) traditional Irish songs & tunes, but he also plays a number of Swedish pieces, which points up the similarities & differences (the old 'compare & contrast...') & make sure you never know what's coming next. Exquisite. And the thing gets better with every hearing." STIRRINGS "This is Christy O'Leary' s first solo album, and, as the accompanying notes say, it is long overdue. A former De Danaan member (early 1980s) and current Boys of the Lough member (since 1985), Christy sings and plays uilleann pipes, tin whistle, fiddle and harmonica. He is joined by his brother, Tim O'Leary (fiddle), Máire Ní Chathasaigh (Irish harp and piano), Richard Curran (violins) and the ubiquitous Chris Newman (guitar, mandolin, keyboards, fretless bass and electric bass), the latter also being the producer of the album. Christy describes his primary musical influences as the traditional music and singing of Kerry and West Cork, and he has been performing professionally since the age of twelve. As the Boys of the Lough are based in Edinburgh, he has also been living there for some years, but in 1992 he married a Swede, and now divides his time between Sweden and Scotland, with occasional forays to Kenmare - hence the album title, which is an apt summary of his personal and professional situation. The five tune sets express perfectly this situation, consisting of a mixture of Scandinavian tunes like Norwegian Wedding March and Slangpolska efter Lungstrom, and Kerry sets like O'Keefe's and Bill the Weaver. (News to me is that, according to the notes, Bill the Weaver was the father of Dennis Murphy and Julia Clifford, two of Sliabh Luachra's finest fiddle players - I'd always thought that the tune, also known as The Orange Rogue, was Northern Irish, especially since, for obvious reasons, William was not a popular name down south). Additionally there is a Máire Ní Chathasaigh composition, The Chestnut Tree, made specially for the uilleann pipes, despite which she plays it on the harp to offset the pipes. The tune sets, though, tend to be pleasant intervals in what is predominantly an album of Irish songs, seven in all, and sung very well in a decorative style. The album begins and ends on a happy and slightly comic note with The Trip over the Mountain and The Groves of Donaghmore, both songs being given what sounds like a Central American or Afro-Caribbean lift, with harmonising whistles playing in a syncopated style, and both lyrics concluding with a couple in a state of happy wedlock. More often though, something goes wrong. Typically, a young man walks out on a bright summer's morning to take the air and survey the beauties of nature, when he encounters a damsel of queenly appearance, with whom he promptly falls in love. A whistlestop romance soon gets thwarted - the young man hasn't enough money or flocks or education, or he doesn't get on with the damsel's father - so he vows to retire to some foreign land, silent arbor, lonesome valley, African desert or the wild woods, to lament his loss for the rest of his days. Two of the songs in particular - The Banks Of Sullane and Jimmy Mo Mhile Stor - are very moving, especially the latter, which is accompanied by Máire Ní Chathasaigh on piano, and is, incidentally, in Colm O'Lochainn's collection, Irish Street Ballads, as an English translation of a well-known Irish love song. Consistency, variety and distinctiveness characterise this album, yet there are lots of echoes - of for instance Leo Rowsome's pipe-playing, Paddy Tunney's singing, and perhaps the abiding influence of Sean O'Riada." THE MODERN DANCE "Christy O'Leary should be no stranger to the folkies among you. He's been a member of the band, The Boys Of The Lough since 1985, imprinting a strong personality with not only his vocals, but his remarkable gift of almost making the uilleann pipes talk. This album, believe it or not, is actually his first. It's a welcome addition to the traditional section of my cds as it contains almost all interpretation of traditional material - with the exception of The Summer Waltz and The Chestnut Tree. Backing Christy on this 12 track gem is the likes of his brother, Tim, Richard Curran, Máire Ní Chathasaigh and, of course, Chris Newman. Tracks like Young Reilly The Fisherman, Moorlough Mary, The Trip Over The Mountain and The Groves Of Donaghmore are simply breathtaking in their musical prowess, and their charm." ROCK 'N' REEL "Christy O'Leary has been part of the backbone of Irish music from De Danann to The Boys of the Lough. One thing he hadn't done was a solo album...well now he has and 'The Northern Bridge' is it. His natural unfettered sounding lead vocals and ability on pipes and whistles have made him a commendable reputation. The Trip Over The Mountain and The Banks Of Sullane have him covering both ends of the traditional song spectrum from light and airy to a dramatic love song while Peigin Leitir Mor gets a welcome revival. The backing from Chris Newman, Tim O'Leary, Richard Curran and Máire Ní Chathasaigh has the right amount of melodic shading as not to overdominate from Christy's own multi-instrumental talents. A healthy proportion of lesser know tunes and some judiciously well chosen songs make for an excellent traditional album. The Northern Bridge will be a pleasure to many who acquaint themselves with it many charms." FOLK ON TAP "Christy O'Leary is a piper, whistle player and fiddler from Co Kerry. During the early eighties he played with De Danaan and since 1985 has been a member of the Boys of the Lough. Having married a Swede in 1992 he now spends much of his time in Sweden, hence the subtitle of this, his first solo CD, 'Songs and tunes from Ireland and Scandinavia'. As his pedigree would suggest Christy O'Leary is an excellent player on all his chosen instruments. He is also a fine singer with a lyrical, very Irish style. He is joined on this set by his brother Tim on fiddle, Máire Ní Chathasaigh on harp and piano and Chris Newman on guitar, mandolin, keyboard and bass. Needless to say all acquit themselves admirably, Newman also being responsible for the excellent production. With a nicely varied programme of songs and instrumentals, interesting arrangements and first-rate playing throughout, this is an album which exudes class." FOLK ROOTS "It was a very pleasant surprise to hear Christy O'Leary's solo album, though it wasn't what I expected, which was jigs, reels and airs on the Irish pipes. What I got was mainly songs with some piping and then either new tunes or Swedish tunes, though the Kerry influence of slides and polkas give an inkling, if you didn't know, of Christy's background. I think this album will prove very popular in that O'Leary has a fine voice and he sings some excellent songs, giving the familiar ones a brightness and freshness with inventive and lively accompaniments thanks to Chris Newman, Máire Ní Chathasaigh and Tim O'Leary. I've always been a fan of his piping and playing tunes from Sweden and elsewhere on the pipes does them no harm, in fact I enjoyed them very much, as I'm sure fans of good music and the Boys of the Lough will agree. Perhaps it is time they all made solo albums and high time that Christy Leary (sic) makes a solo piping album." SING OUT "Christy O'Leary lent a distinctive lift and flavor to The Boys of the Lough and became an integral member of the band as soon as he joined them on their 12th album a dozen years ago. Without diminishing his role in the band, he has now released his first solo recording. What a beauty it is! Accompanied by bandmate Chris Newman on guitars and mandolins, O'Leary's brother Tim on fiddle, Máire Ní Chathasaigh on harp, and Richard Curran on violins, Christy sings seven songs of love and parting in his emotion-laden voice, and leads five sets of tunes not just on his uilleann pipes and tin whistle, but some on fiddle and harmonica as well." ESSEX FOLK NEWS "Christy O'Leary (member of Boys of the Lough) hales from Eire, lives in Scotland, and commutes to Sweden. So the title, The Northern Bridge, is a symbolic description of Christy's professional and personal journey. He plays the uilleann pipes (on four of the five instrumental tracks), tin whistles, fiddle and harmonica. He also sings - on seven of the twelve tracks; one unaccompanied. He is backed by three others who, between them, can provide fiddle, Irish harp, piano, guitars, mandolins, keyboards, fretless and electric bass. My favourite track was, by good chance, the longest - over seven minutes: 'Rocking the Cradle' followed by The Chestnut Tree. The slurs and half notes which sit so well on the uilleann pipes were put to hair-prickling use. A very pleasant recording, with nearly 49 minutes of outstanding playing and arrangements." FOLKEMUSIK i Danmark "Irske Christy O'Leary har siden midten af firserne været piper og fløjtespiller (og lejlighedsvis sanger) med Boys of the Lough, og dette er hans første soloudgivelse. Ikke for tidligt, må man sige, for det er blevet en smuk og afrundet cd med en egen stilfærdig værdighed over sig. Syv gode sange (en enkelt på gælisk) sunget med en lidt gammeldags, men ikke arkaiserende, ornamentering, og en stemme som I sin dikkedarløse ligefremhed fungerer gotd uden at være hverken 'stor' eller 'egenartet', men bare fortæller de klassiske historier som var det den enkleste sag af verden. Hertil kommer fem instrumentale stræk, som ikke mindst er interessante ved at inkludere den indtagende Summer Waltz af Ale Möller og et par stykker, overleveret af O'Leary's nabo fra Askersund (han er svensk gift). Selvølgelgig er det primært O'Leary's plade, men kollega Chris Newman fra Boys of the Lough har også en ganske væsentlig rolle, både på guitar, mandolin, keyboards og elbas (hvad der i rytmisk henseende trækker musikken fri af det helt traditionelle), foruden i producerrollen som ansvarlig for det tiltalende luftige lybillede, hvor også Máire Ní Chathasaigh på harpe og klaver og O'Leary's broder Tim på violin har gæsteroller. En af cd'ens gode sidegevinster er I øvrigt det, den lægger til billedet af Newman's alsidighed, ikke mindst som akkompagnatør. Med sin stilfærdige, uanmasende autoritet, helt fri for smartness og kulørte lamper, er det langtidsholdbar musik. Og så kommer i øvrigt O'Leary of Newman til Danmark i slutningen af maj."
FOLK MUSIC in Denmark "Since the mid-eighties Irishman Christy O'Leary has been piper and whistle-player (and occasional singer) with Boys of the Lough, and this is his first solo release. None too soon, one might say, for it is a beautiful and well-rounded CD with a certain gentle dignity overall. Seven good songs (one in Gaelic) sung with a somewhat traditional, but not outdated, ornamentation, and one voice which in its unembellished directness serves well without being either 'grand' or 'singular', but just tells the classic stories as if it were the simplest thing of the world. Included here are five instrumental tracks, which are interesting not least for including the adopted Summer Waltz by Ale Möller and a pair of pieces preserved by O'Leary's neighbor from Askersund (Christy is Swedish-married). Of course it's primarily O'Leary's recording, but colleague Chris Newman from Boys of the Lough also has a considerable role, both on guitar, mandolin, keyboards and electric bass (which in rhythmic perspective pulls the music free of the strictly traditional), and furthermore in the role of producer, responsible for the attractive, airy soundscape, where Maire Ní Chathasaigh on harp and piano and O'Leary's brother Tim on violin also have guest roles. One of the CD's side benefits is that it rounds out the picture of Newman's versatility, not least as an accompanist. But its gentle, unassuming authority, entirely free of chic and glitter, is the enduringly valid music. And besides that, O'Leary and Newman are coming to Denmark at the end of May." Many thanks to Jim Lucas of Helsingør, Denmark for the translation.